Both the Federal Act on Direct Federal Taxation (DBG) as well as the Federal Act on the Harmonisation of Income Taxes of the Cantons and Communities (StHG) allow non-working foreign citizens with Swiss residency to benefit from a special kind of income and wealth taxation. This historically anchored regulation has attracted wealthy foreign citizens to take up residency in Switzerland and will likely continue to do so. 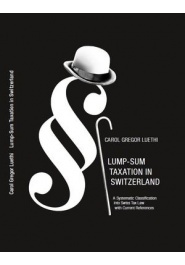 For the first time in over 150 years of lump-sum taxation history this book gives a systematical and comprehensive overview on the revised regulations and includes several side effects of taxation.